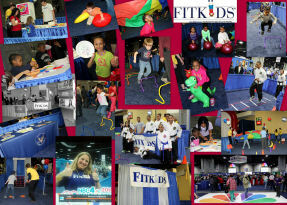 On March 16th and 17th 2013, Fit Kids™ joined the NBC4 Health and Fitness Expo at the Walter E. Convention Center in Washington DC. Thousands of children ascended the Fit Kids™ Fun Zones over the span of two days! Fit Kids™ offered several activities: Wacky Relays with bouncing hot dogs and ponies, Hula Hoopla, Bean Bag Toss, and Parachute Palooza. Along with the Fitness Zones, Fit Kids™ also emphasized the importance of good nutrition. Children could draw their very own My Plate to take home, and also enjoyed playing a sorting game with various fruits and vegetables. Fit Kids™ once again partnered with the President’s Council on Fitness, Sports and Nutrition who set up an agility obstacle course filled with agility ladder, hoops, and hurdles. Fit Kids™ had a memorable experience at the Health & Fitness Expo and hope to take part again next year!